It was only appropriate that the day I visited the Fernbank Museum of Natural History to see their current exhibition "Water," it was raining. Superbly crafted, scientifically current, and masterfully enticing, I was about to experience the main ingredient of our ocean planet in a unique fashion. On this particular visit, I specifically went to Fernbank to see Water, but when checking out the website before driving there, I saw that there’s an IMAX film playing that sounded intriguing. It's "Grand Canyon Adventure: River at Risk," which focuses on the Colorado River. Certainly tied into the water theme that was emerging for the afternoon, I added that to my schedule. An additional bonus was getting to see the trees of the museum’s first annual "Winter Wonderland" celebration. There are more than 20 trees, representative of countries around the world, displayed in the main rotunda with the giant dinosaurs! I'll blog about Winter Wonderland separately…look for it soon. To originally have had only one exhibit on my itinerary for the afternoon, it turned out to be quite a fun-filled exciting day. I wasn't sure what to expect inside the Water exhibit, but I knew when I saw the first advertisement that I wanted to see it. It turns out to be an exhaustive retrospective on water's life-giving role on planet Earth. Incredibly impressed with the technology used to present the water theme, I soon began turning corners expecting that the exhibit was finished. It presumably cost a lot of money and time to create such elaborate displays and there couldn't be much more, I thought. But to my surprise and excitement, the exhibit continued for an impressive duration. Where some exhibits build anticipation by beginning with the less "showy" displays, saving the grand finale for the end, Water delivers a constant wow-factor throughout. 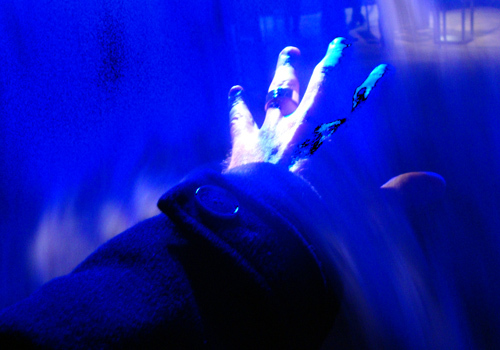 I entered the exhibit, located on the lower floor of the museum where, just previously shrouded in darkness, there emerged an electric blue glow. Once I stepped in, I realized that it was a portal akin to The Guardian of Forever in the Star Trek episode, "City on the Edge of Forever." The doorway to Water is a billowy white blanket of cascading vapor that is illuminated with at least a dozen depictions of the word "water," each image in a different ­­­language. There was a family doing exactly what I would be doing momentarily…playing in the doorway. A mother with a video camera and a grandmother with a digital camera were making digital memories of their kids passing in and out of the door, all the while oblivious to how much more fun awaited them inside. After they went in (I patiently waited because it was my turn to play next), I did indeed experiment with the curious fog…and I too took a few photos. For the not so adventurous, there's an alternate entry, but I recommend the playful option. Already enchanted with the exhibit, I very quickly discovered that it was not only a spectacle of technology, but highly educational as well…and many of the learning stations are also interactive. I found myself wanting to be a kid again. 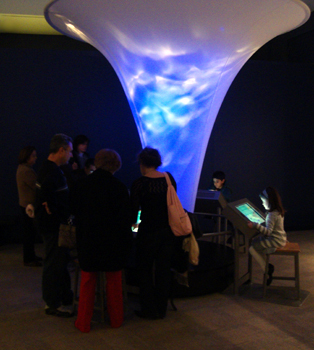 At the same time, quite a few of the exhibits, while designed with children in mind, welcome curious grownups, too. 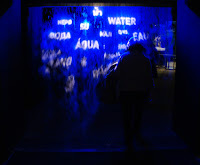 Water (H2O), not surprisingly, is everywhere in the Water exhibit… in all of its forms. One exhibit in particular displays on a tier the process of ice, which you can touch, turning into liquid and then transforming into gas. 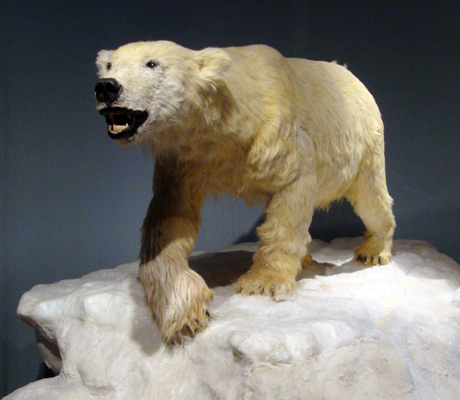 There are lots of animals in the exhibit, some live and some replicas, including penguins, fish, birds, a shark, and a life-size polar bear! 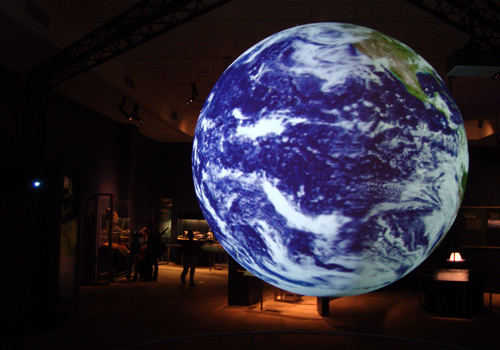 The absolute coolest part of the exhibit, I think, is the "Science on a Sphere." It'd been a long time since I'd seen this kind of display so when I turned the corner after the first few displays, the huge, floating, rotating, illuminated Earth totally caught my attention. 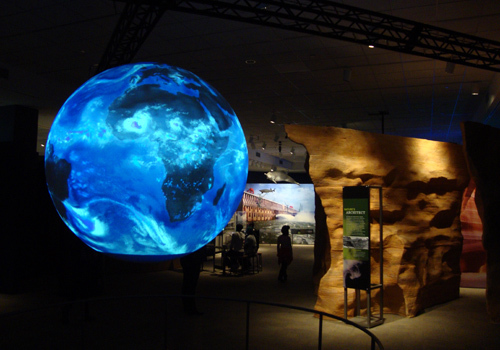 Provided by the National Oceanic and Atmospheric Administration (NOAA), Science on a Sphere technology (a sphere video screen illuminated by four projectors) is in museums around the world. Whether you've seen one or a dozen, it's entrancing every time. 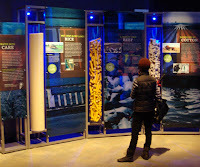 I turned a corner in the exhibit time and again and found something new to learn about water. From the ecologic, economic and cultural effects of dam construction to the environmental and agricultural effects of using antiquated irrigation technology, Water delivers. I had arrived at Fernbank about 15 minutes before the IMAX film started, so I watched that before exploring Water. 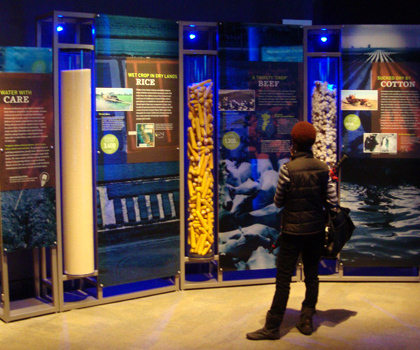 It was to my advantage…the content of the film gave me valuable reference points that enhanced the exhibit. I love IMAX films, whether an IMAX documentary or a Hollywood blockbuster, IMAX is the way to go. 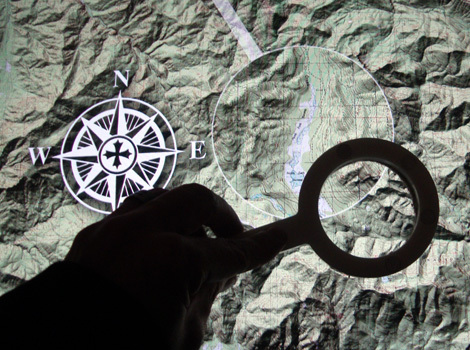 "Grand Canyon Adventure: River at Risk" is no exception. I hadn't even planed on seeing a show, but the advertisement called to me and as a member it was only $8.56…a lot less than a regular cinema ticket (membership does indeed have its benefits). When I went in, the volunteer who took my ticket told me where to find the best seat in the house (and of course she was right). With a five-story screen, there's hardly a "bad" seat, but the top row center of this particular theater is the place to be. This theater is more modest in number of seats than some other IMAX theaters I've been to, which translates into the top row being just right. On a side note, I've been to Fernbank numerous times over the past four months that I've been back in Atlanta and the volunteers have consistently been incredibly kind, friendly, and generously helpful "ambassadors." They add a special touch to the Fernbank experience. Although 2D in presentation, the film is adrenaline-inducing. 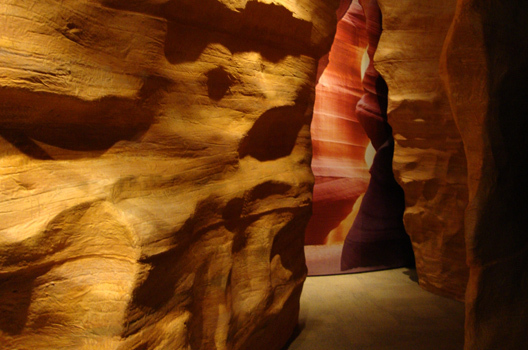 From 3D-esque special effects to raft-mounted captures of several white water portions of the excursion, the film is a spectacular way to see the Grand Canyon. And it delivers a sense of urgency in the necessity to ramp up our river conservation efforts and water consumption practices. Have I been flooded with Natural History or am I still thirsty enough to return for more? Fernbank is a favorite of mine and of Atlanta's. Several friends have mentioned wanting to go the museum, either because they've not been in a long time or to see a specific exhibit. Count me in…I'll return anytime!